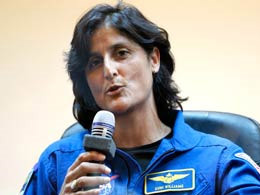 Kolkata, April 2 : Calling Indians creative and innovative, US astronaut Sunita Williams Tuesday said that an international space programme was the "right way to go". "What I see when I come to India is that there are a lot of creative and innovative people who are ready and willing to jump ahead and be entrepreneurial and add to any programme out there," Williams said at a media conference at the Science City auditorium here Tuesday. "I have had a real honour and privilege to be a part of a space programme that is not only US but also international. That is the right way to have a space programme, international, because it is our planet, not one country. I see myself as citizen of the universe and I think we are all lucky," Williams added. Williams, 47, who holds the world record for the most spacewalk time - 50 hours 40 minutes - by a female astronaut, is in India on a week-long trip. "The international space programme is alive and kicking and is wanting more and more people," said the US-born Williams, whose father is from Mehsana in Gujarat. "Once we leave our atmosphere, we have to seriously think about being protected from radiation. Even just going to the moon... there is increase in radiation," said Williams, who also holds the record for the longest spaceflight time by a female astronaut - 322 days in space on two missions. "There are a lot of things that we have to understand and another thing the people have to like each other quite a bit... learn to interact with each other. We also get to learn about leadership and powership," added Williams. She stressed the need to think about smarter ways to do things in order to sustain India's growing population. "There are a lot of people in India. What that means is that there are great minds, great ideas, creative, people thinking about green energy. I have seen it in the newspapers," she said. During the week, she will be interacting with students in Kolkata, Mumbai and Gujarat.